How Much Do Floating Stairs Cost? Prefabricated Stairs: Mechanical or Welded? With a process as simple and sleek as its design, Viewrail FLIGHT is the stress-free way to bring luxurious floating stairs into your home. Read on for your FLIGHT plan. Our experts work with you to engineer a staircase that is beautiful, safe, and matches your exact specifications. Begin by letting us know what the dimensions of your staircase will need to be. Our dedicated Viewrail FLIGHT team is ready to work with you. Simply fill out the FLIGHT Quote Request Form with some basic information about your project, and we’ll contact you within 24 hours to start the design process. 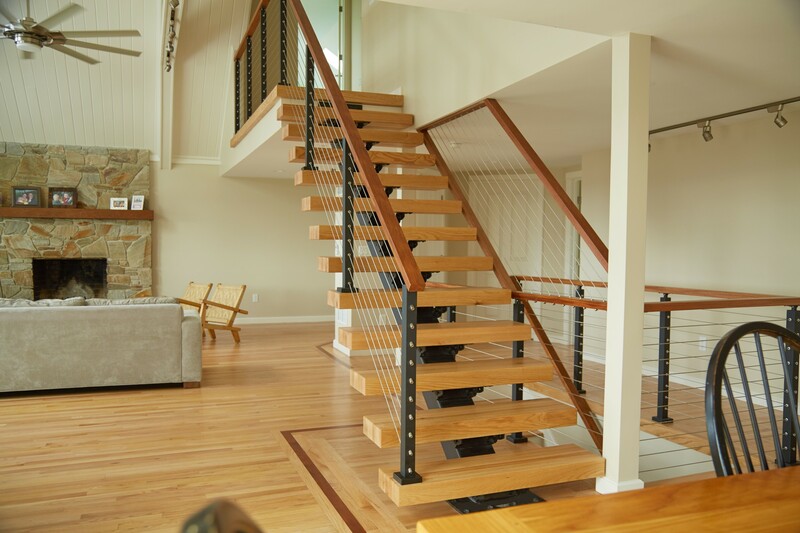 Together, we’ll identify the measurements for your floating staircase and select your design preferences. Nearly every aspect of FLIGHT is customizable, including the stringer configuration, railing style, and tread type. Would you like a black stringer and posts paired with red oak treads and handrail? Or do you prefer a white stringer with sleek glass railing? The choice is yours, but you won’t be alone through this process. Our FLIGHT experts are ready to help you each step of the way. Find out more on the floating stairs design page. Once the design of your floating stair has been finalized, the FLIGHT team will send you a quote for your project. When you’re ready to move forward, we’ll request a partial down-payment and begin the engineering process. After you’ve accepted the quote, our engineering team will create detailed shop drawings of your FLIGHT system. 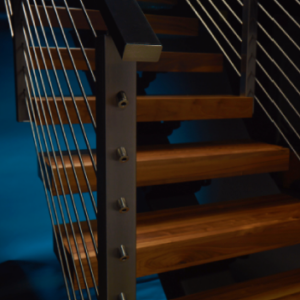 The engineers ensure that your staircase will be strong, safe, and built to your exact specifications. You’ll receive the shop drawings showing your FLIGHT with the dimensions and customizations discussed during the design phase. Once you approve the plans, they will be sent to the production crew. This is when our craftsmen will bring your FLIGHT to life. Every piece of your staircase will be custom manufactured at our plant in Indiana. Every stringer and post is cut, welded, and powder coated to your specifications. Each thick tread is carefully crafted and finished to perfection. Every component leaves our shop completely finished and ready for installation. However, if you’d prefer to stain your own treads we also provide unfinished treads and wooden handrail, which you can customize yourself. During the production process, our passionate customer service team will keep you updated about the status of your project and answer any questions you may have. You can expect to receive your FLIGHT system six weeks after signing off on the shop drawings. Everything will arrive carefully packaged and ready for installation. Viewrail FLIGHT is designed to be DIY friendly – you won’t have to hire an installation team to do it for you. Our easy-to-read floating stair installation guide will walk you through each step. But if you don’t feel comfortable doing it yourself, you could hire a local contractor or builder. And that’s it. Putting a floating staircase in your home is as simple as that with Viewrail FLIGHT. Click below to get in touch with us and begin your journey. Your cart is empty. Add a few items to your cart to begin.